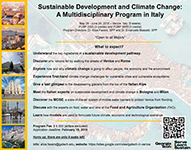 The Georgia Tech Study Abroad Program on Sustainable Development and Climate Change in Italy offers a multi-disciplinary learning experience through a combination of in-class lectures, guest speakers and instructional field trips. It is a 5-week, 6-credit program with two 3-credit courses on Climate Policy and Sustainable Development. Dr. Alice Favero and Dr. Emanuele Massetti are the program directors and instructors. In 2018, the program started on May 27 and ended on June 30. 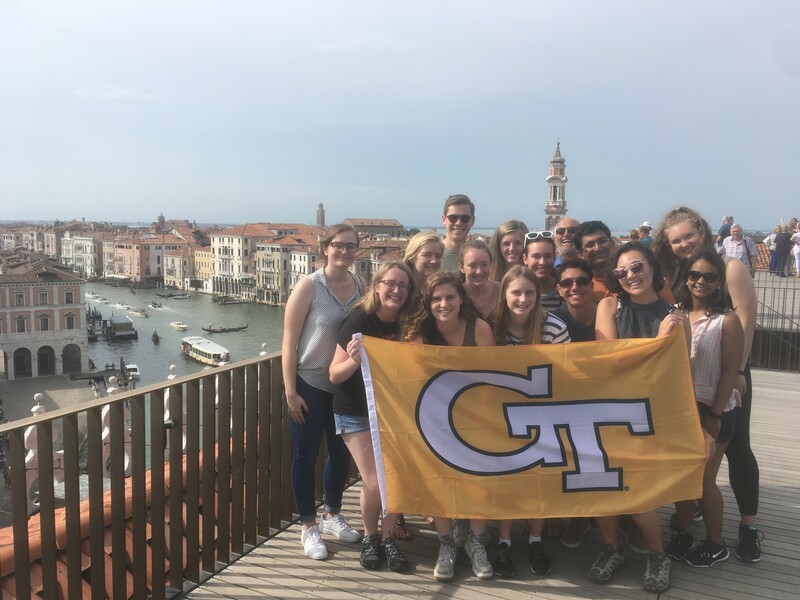 The program was based in Venice, Italy and every week students had at least one field trip outside Venice, including visits to Rome, Bologna, Milan and the Dolomite mountains. In 2018 a total of 14 students from 10 majors participated to the program. 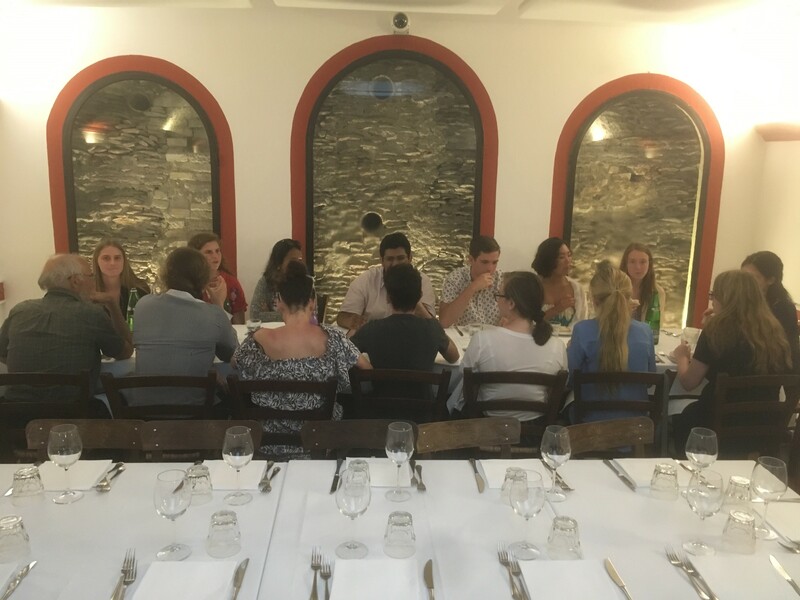 During the program students were exposed to a range of learning experiences from in-class lectures to the first-hand observation of sustainability challenges and solutions in Italy. Determine the role of technical progress in achieving sustainable development and reduce climate change impacts. Professionally navigate the debate on sustainability and on climate change policy. During the 5-week program, students have the opportunity to participate to lectures from Italian experts on sustainable development and climate change. A total of 5 Intergovernmental Panel on Climate Change (IPCC) authors gave lectures during the program. Guest lectures provided the opportunity to ask questions receive feedback to world-class experts on climate change and sustainable development. Bellow a brief description of some guest speakers and the topic discussed during the talk. Dr. Antonio Navarra is the President of the Euro-Mediterranean Center on Climate Change. He’s an Affiliate Scientist of the National Center for Atmospheric Research in the US and a member of the Scientific Advisory Committee of the Asia-Pacific Climate Center in South Korea. During the CMCC visit, students learned about the CMCC's work on investigating and modelling our climate system and its interactions with society and the environment to guarantee reliable, rigorous, and timely scientific results to stimulate sustainable growth, protect the environment, and to develop science driven adaptation and mitigation policies in a changing climate. Dr. Francesco Tubiello is a Senior Officer at Food and Agriculture Organization (FAO), where he serves as Team Leader of Environmental Statistics, and IPCC author. His main area of expertise is in assessing the linkages between agriculture, food security and climate change. At FAO students discussed with Dr. Tubiello how FAO data on land use and emissions are collected, analyzed and disseminated. Professor Carlo Carraro is President Emeritus and Professor of Environmental Economics at Ca’ Foscari University of Venice. He is the President of the education division of H-Farm, a start-up incubator. He holds a Ph.D. in Economics from Princeton University. Professor Carraro is also Vice-Chair of the Working Group III and Member of the Bureau of IPCC. Students met Professor Carraro in the campus of H-Farm in the beautiful countryside near Venice. During the meeting Professor Carraro shared his experience of twenty years of international negotiations on climate change, discussing challenges and opportunities of the Paris Agreement. Dr. Massimo Tavoni is associate professor at the School of Management of Politecnico di Milano. He has been fellow at the Center for Advanced Studied in Behavioral Sciences at Stanford University, and post-doctoral fellow at Princeton University. Students met Dr. Tavoni at the School of Management of Politecnico di Milano. During the meeting, students learned how researchers use models to study emission reduction pathways and they were exposed to yet to be published results from recent modeling meetings. Then, students played an interactive game that made them experience the difficulties that negotiators face when they discuss international agreements on climate change. 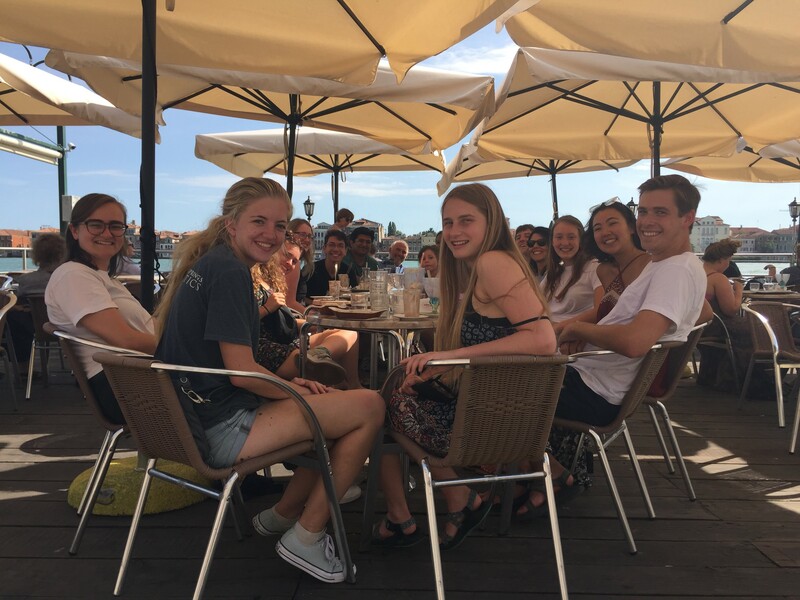 Students travelled to Bologna to visit the Euro-Mediterranean Center on Climate Change (CMCC) and to talk with climate experts. Before the meeting students visited the historical city center with the oldest university in the world, had a taste of Bologna street food and climbed the 498 steps (97 meters) to the top of the Asinelli’s tower, the tallest medieval tower in the world. A day trip to the Dolomite Mountains – a UNESCO World Heritage Natural site – offered the opportunity to witness the disappearance of alpine glaciers and the ecological, cultural and economic challenges of climate change. Maurizio and Dino, two professional alpine guides, guided the group during a three-hour hike and gave a first-hand account of changes to the ecosystem. Students tasted the rich local cuisine in a mountain hut at the footsteps of the Marmolada glacier. From Venice Central Station students boarded the Frecciarossa high-speed train to Rome for a two-day field trip. The high speed railway is an engineering mega-infrastructure with a 70 miles stretch almost entirely under tunnel. In Rome, students met with Dr. Francesco Tubiello (FAO expert on food, water and agriculture) in the iconic FAO headquarter located in the middle of the largest archaeological park in the world. A guided tour of the historic center of the Eternal City offered an unforgettable cultural experience and provided the perfect setting to discuss why nations prosper and why they fail. Students visited H-Farm, Italy’s most advanced technology education campus. It is an international hub of innovation, a unique model and clever mix of Italian tradition and true international entrepreneurial mindset that put in connection corporations and startups. Here, early-stage tech companies and tech startups can work and live together in a farm-like environment where talents and business can really thrive. Students had a full-day private boat trip of the Venetian Lagoon and the MOSE – a state-of-the-art system of mobile barriers. They learned about technological solutions and challenges to protect Venice from rising seas and from storm surges. During the trip students discussed the project in terms of effects on local ecosystems, its support to local economy, and the effect of sea level rise on Venice with Dr. Giovanni Cecconi, one of the engineers of MOSE. The students were able to visit the below sea-level tunnels built to anchor the mobile barriers. Students took a train to Milan central station and met with Dr. Tavoni at the Politecnico. After experiencing the complexity of international climate policy students had the best ice cream in Milan, a guided tour of Leonardo’s Last Supper. Before boarding the train students visited the historical center of Milan. Dreaming of living in Venice and learning about sustainable development and climate change? 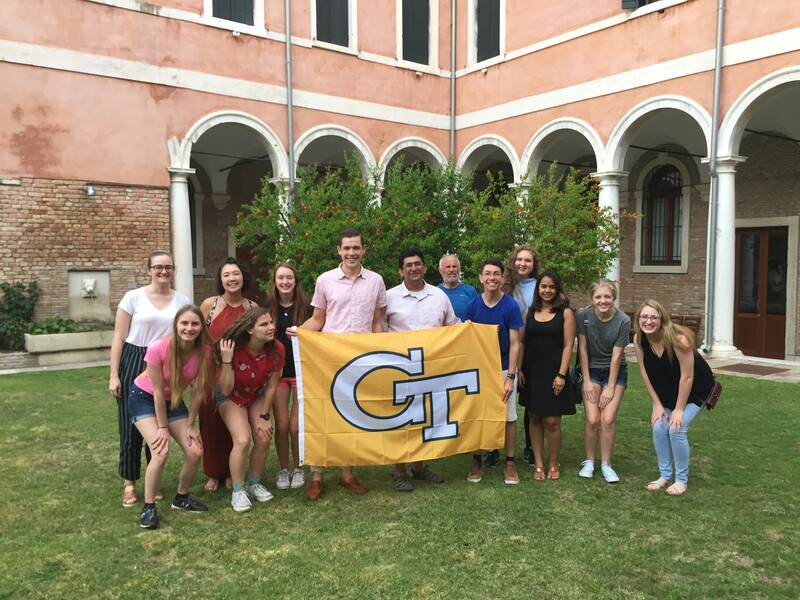 The new GT Study Abroad program on Sustainable Development and Climate Change in Italy offers an irreplaceable and multidisciplinary learning experience in a unique environment: Venice. Venice is a city with a glorious past, in a fragile environment, menaced by sea-level rise and by unsustainable economic development. It is a safe and stimulating environment to discuss about the challenges of sustainable development and climate change. With additional trips to the FAO Headquarters in Rome, an excursion to the Alps, a guided tour of the unique MOSE system of barriers to protect Venice from storm waters, and with the participation of local climate and development experts, the program offers a terrific mix of academic and cultural activities for the students. For additional information visit the Website or contact Dr. Alice Favero alice.favero@gatech.edu.